Since the age of 6 Kirsty has been making and decorating celebration cakes. Born in Great Yarmouth and growing up kirsty dreamt of opening a tea room and celebration cake company. In 2014 this dream came true. This was mainly fuelled by her grandfather who owned the Tolhouse Tea Rooms. 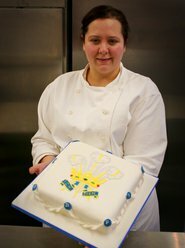 Kirsty began her career as a baker at the age of 15 making and decorating celebration cakes for a bakery in Gorleston. After 2 years she juggled full time work at the bakery and going to college where she obtained multiple qualifications in various disciplines of catering. Kirsty went on from here to kick off a 9 year career as a chef in various 4 star hotels around norfolk becoming a very sort after chef . Kirsty was head hunted by a hotel in holland to be their head chef this was an oppourtunity she could not turn down. Even the lure of the european hotel scene couldn't quell the desire to go back to her patisserie routes. Kirsty came back to the u.k and worked at Palmers in great yarmouth making all of the cakes for the coffee shop and celebration cakes. Instantly Kirsty realised she was in the right line of work again . After 3 years at Palmers Kirsty's dreams of opening a tea rooms took a turn for the better with her perfect property becoming available. Kirsty dreamt as a child of opening an ''Old English Tea Rooms'' in an historic building. Anna Sewell House became available this was too good to be true surely. The property owner shared Kirsty's Ideology of good products for reasonable prices. 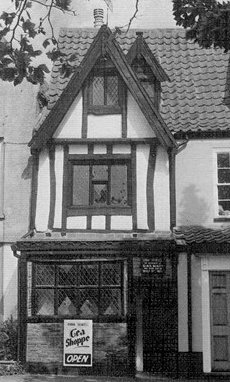 And providing the people of Great Yarmouth with the local tea rooms owned by a local family it has lacked since the closing of The Tolhouse tea rooms and Anna Sewell House . Anna Sewell House was the birth place of the famous author of the Black Beauty Novel. Anna was born on 30th March 1820 in the upper room of the house. This precious historical building has sat empty for a few years. Kirsty Hopes to make the forgotten gem of Great Yarmouth a well know fixture of the community once again and return it to its former glory.